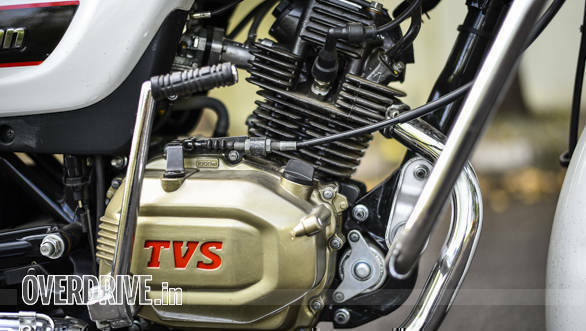 The TVS Radeon aims to break into a category where TVS Motor Company already has three players, the Star City, Sport, and Victor. 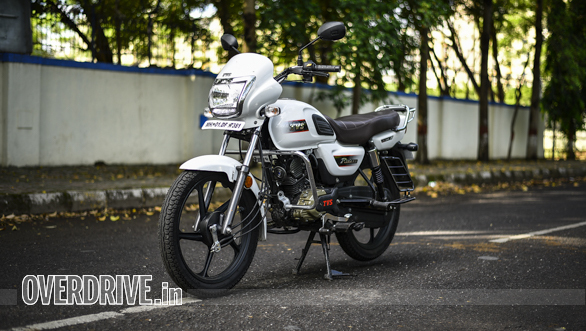 The 110cc commuter segment is also a very sensitive one, with winners in the category being sales drivers for their respective manufacturer. So where does the recently launched Radeon fit within the company's lineup and in its segment? Let's find out. There is no simpler way to put it. The Radeon is targeted at self-employed 25 to 35-year-olds in small towns and rural parts of the country. And it hence seems to conform to the design approach of the top motorcycle in that space, the Splendor, and largely its segment. What sets it apart, however, are the added retro touches that make it look more premium. 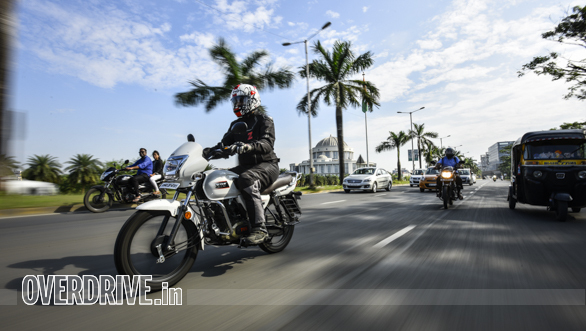 TVS should look at this as a compliment considering the reverential gazes this motorcycle drew while we were out testing it. These touches include the champagne gold finish on the engine casing, the chrome bezel surround for the headlamp, the chrome surround for the twin pod square-shaped instrumentation, long brown seat, as well as rubber tank pads on either side, and a chrome silencer. The chrome and gold bits do bring it attention as we found out. 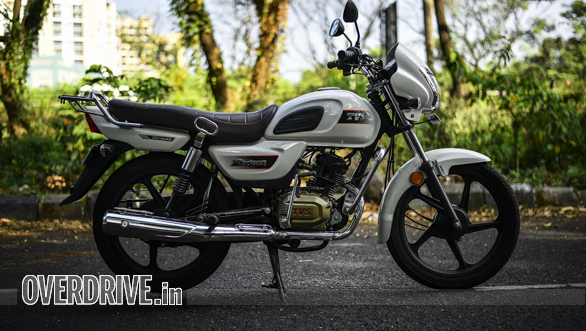 They lend it a distinct look, that may tickle the retro motorcycle aspirations of its target user. I felt the touches were a tad ostentatious for my taste but they should work in the semi-urban setting from which TVS expects the bulk of Radeon sales. The white paint finish on our test motorcycle looks good and the 3D TVS and Radeon emblems stand out against subtle graphics. The LED strip under the headlamp adds to the bejeweled effect while also serving its purpose. The motorcycle feels sturdily built. The quality of plastics and switchgear is great for its segment and feels like it should last without complaint for a long time. From the sides, the long and wide brown seat is a highlight and looks like it will accommodate two adults of any size in comfort. The seat ends in a grab rail with a small parcel tray behind it, adding to functionality. On the whole, the Radeon,'s design stands out by catering to user aspirations, despite not venturing too far from the segment mould. It feels well put together with materials that should last over prolonged, daily use. The Radeon comes powered by TVS's Duralife engine, a variant of which is also seen on its other 110cc offerings. The air-cooled motor displaces 109.7cc, and outputs 8.4PS and 8.7Nm here. 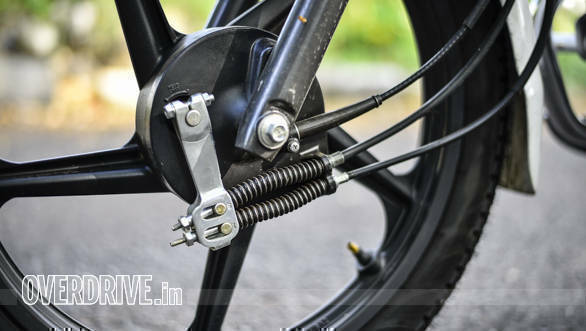 It is mated to a 4-speed gearbox, all housed in a single downtube chassis which uses the engine as a stressed member. The Radeon features both, electric and kickstart as standard. 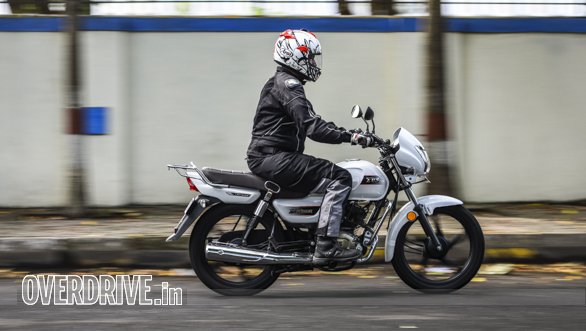 Thumb the starter and the single comes to life with a surprisingly sporty exhaust note. The engine produces its peak torque early at 5,000rpm, making it a breeze to accelerate the Radeon to traffic speeds. In our tests, the Radeon reached 60kmph from standstill in 7.1 seconds. Mind, its torque spread may also be a product of the user's need to always have a pillion or luggage with them. 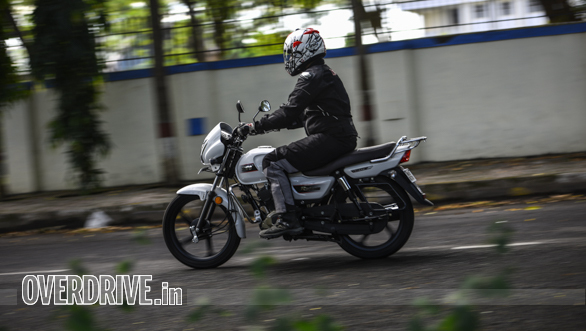 The engine is refined up to its sweet spot around 60-65kmph in fourth gear. Beyond this, some vibrations can be felt up to 80kmph. 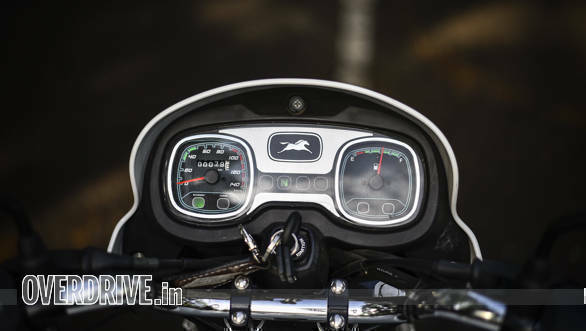 But trying to push the Radeon beyond 85kmph means you will feel vibrations at the handle, footpegs, as well from the seat. But that's not the purpose of this motorcycle. 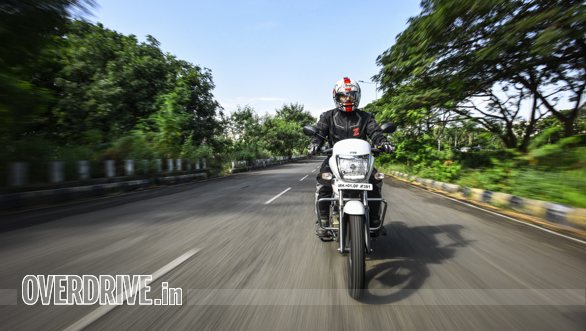 It will primarily be ridden at steady 60kmph speeds or lower and offer high fuel efficiency. During our tests, the Radeon returned fuel consumption figures of 67.77kmpl in the city and 74.39kmpl on the highway. These combined with its 10-litre tank should give it an impressive range of about 700km. 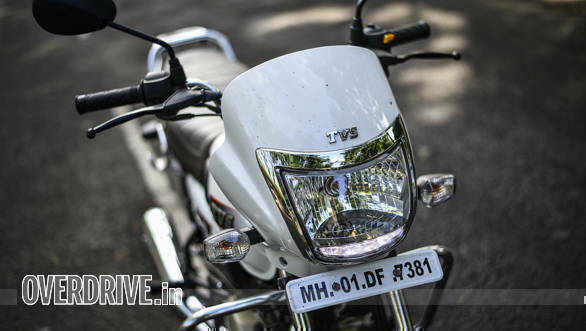 The TVS Radeon is a simple motorcycle, in that it has a straightforward approach in the ride department. The seating position, pegs, and handle feel natural for this 5'10" reviewer. This and the low seat height make the Radeon usable for riders of all sizes. 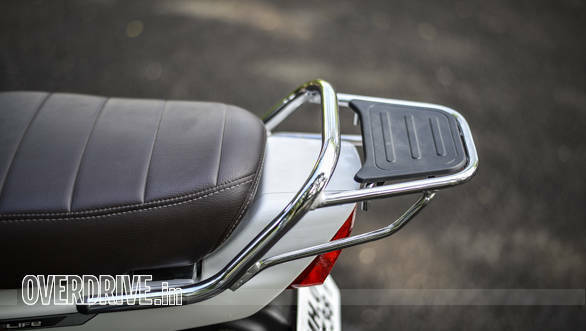 The handlebar is not very wide which makes it easy to fit the bike through narrow gaps in moving traffic. 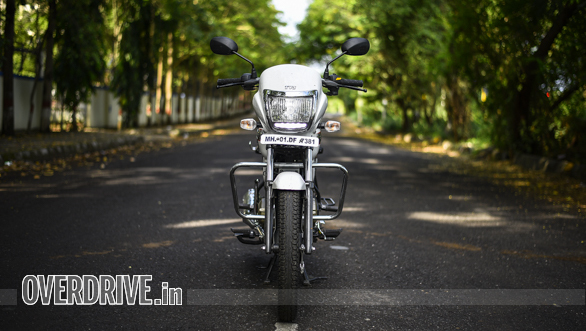 The light feel of the front helps with making the motorcycle seem easy to manoeuvre. The seat is wide and cushioned enough to make it comfortable. The suspension setup is slightly on the firmer side. 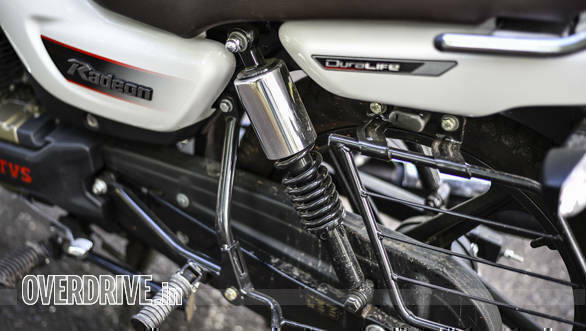 The telescopic front and 5-step adjustable hydraulic twin shock absorbers at the rear of the Radeon will ensure that they are not easy to bottom out, even on broken roads. This should work well even at times when the motorcycle is loaded with heavy luggage and pillion. 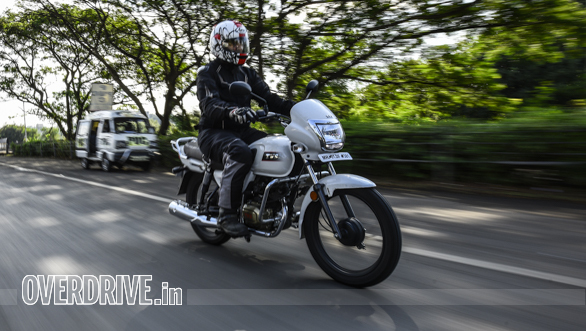 The 18-inch TVS Dura Grip tyres too seem to be selected to handle a variety of surfaces. They felt grippy under all conditions I could throw at them. Clutch operation felt a little springy at times and took some time to get used to. This did not in any way hamper gear changes, which slot in place easily with the heel and toe shifter. In terms of braking, the Radeon has drums at both ends, with no option for a disc up front. 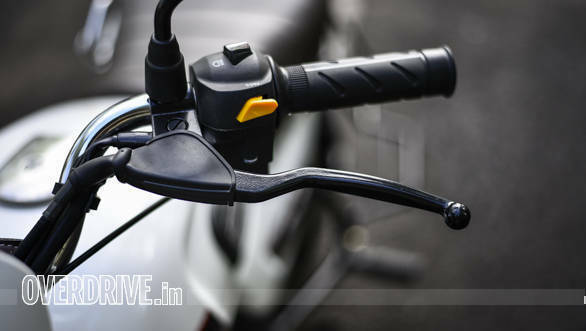 It is also the first bike of the segment to get combined brakes which TVS refers to as Synchronised Braking Technology (SBT). Braking from different speeds, the Radeon's brakes feel powerful and bring it to a halt in a comfortable, confident manner. The Radeon feels par for the course in terms of rideability. 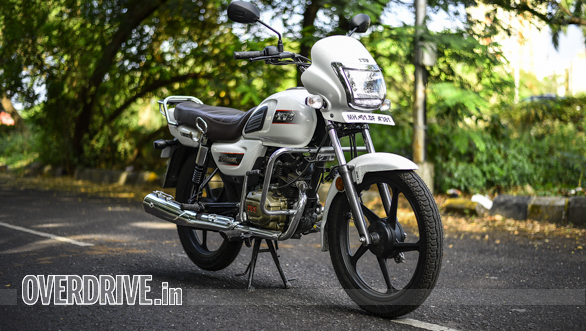 It's slightly firmer suspension, good ground clearance and light steering make it an easy to live with motorcycle. TVS has not landed an extraordinary offering with the Radeon. But then what it aims with this motorcycle is not to distinguish itself, but rather find a place amongst the volume sellers of the segment. This is their spin on a formula which has worked for decades and continues to across smaller towns and rural areas of India. In this respect, the Radeon is a unique take with its retro-inspired styling, refined engine and a solid built. The quality and refinement suggest longevity, as does a 5-year warranty. 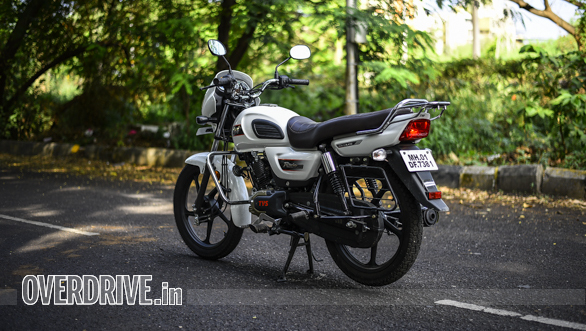 For the price, it also offers more features such as the side stand warning, eco and power mode indicators, as well as optional USB charging point. This makes the Radeon a value offering from TVS.